Switchgrass (Panicum virgatum) is a vigorous warm season, native perennial grass adapted to Wisconsin and planted for many purposes including livestock grazing, wildlife cover, and as a biofuel crop. Switchgrass begins growth in late spring and continues through the summer if moisture is available. It grows 3 to 6 feet in small to large sodded clumps that spread slowly from numerous scaly creeping rhizomes. The leaves have a bluish cast and can attain a length of 2 feet. At the junction of the leaf blade and leaf sheath the ligule is a dense ring or cup of hairs on the upper leaf surface. The panicles are pyramid shaped with many purplish spikelets. Under native conditions it is usually found along creeks, streams and protected areas, but establishment and productivity has been best in fields with loam to sandy loam soils. Switchgrass varieties/ecotypes vary widely in their adaptation to environmental conditions. Cold winters, hot summers, and day length are the most important of these environmental factors, all of which vary according to latitude. Because of this, switchgrass varieties/ecotypes should be moved no more than one hardiness zone from their origin. Sunburst originates within hardiness zone 4 and Cave-in-Rock originates within hardiness zone 5. Both are well adapted to the north central USA, with excellent tolerance to cold winters and relatively high biomass yield. Three-year yield averages for common varieties adapted to the north central United States across several locations are summarized in Table 1. Switchgrass has relatively small seed averaging approximately 370,000 seeds per pound. The suggested seeding rate is 6 to 7 pounds of pure live seed when close drilled (8 inches or less between rows) or broadcasted. Switchgrass should be planted in the spring after soil temperature is above 60°F. Planting is recommended on a firm, well prepared seedbed at a depth of 1/2 to 3/4 inch. Cultipacking after planting helps establish good contact with soil and speeds germination. No-till planting of switchgrass has also been successful in Wisconsin. If possible plant after no-till soybeans as no-till corn fields have rougher terrain that can make harvesting of biomass difficult. Switchgrass is slow to establish and many of the resources collected in the establishment years are used to develop an extensive root system. Due to this, switchgrass should not be grazed or cut during the seeding year unless weed density is high or growth is exceptional. 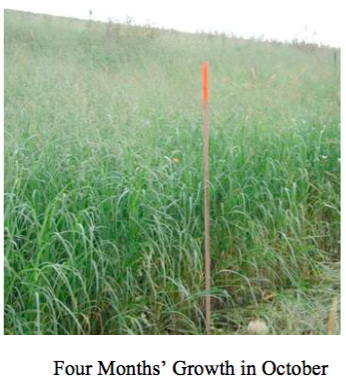 Several management methods can be utilized for managing weeds while establishing switchgrass. Selection of the most appropriate method is based on the weed species present and the appropriate density. In general, sites with extensive perennial grass infestations (e.g. quackgrass) should be avoided as they are difficult to manage while establishing switchgrass. If possible, reduce the weed populations as much as possible before planting. This can be done with repeated cultivations and/or burndown herbicide applications before planting switchgrass. 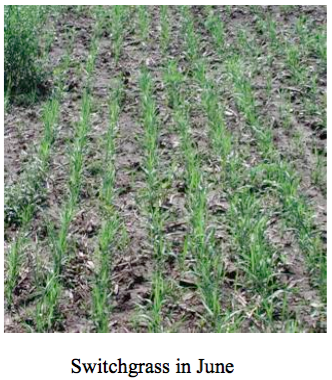 Growing roundup ready crops year(s) prior to establishment of switchgrass is also effective in reducing weed populations, especially perennial weeds. Annual broadleaf weeds are common in the establishment year and if populations are dense, establishment can be reduced. 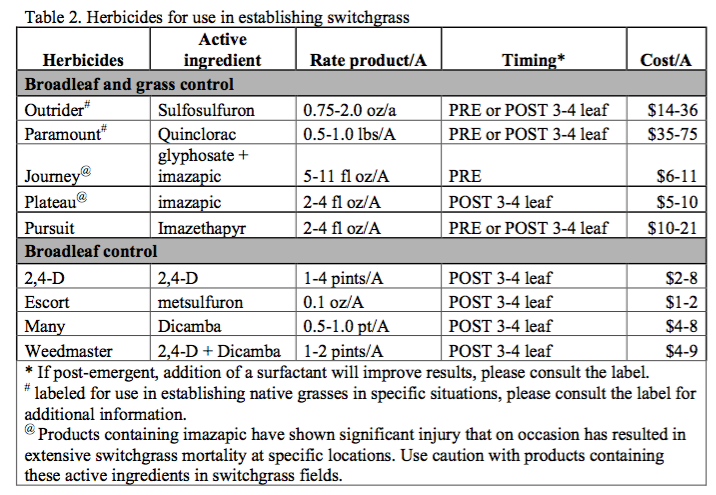 These weeds can be controlled with timely mowing and/or the use of a labeled broadleaf herbicide (see Table 2). If mowing, leave at least 6 inches of stubble. If a broadleaf herbicide is used, wait until switchgrass plants have at least 3-4 leaves (or are 3-4 inches tall) before application to avoid injury. Weedy grasses can also be troublesome as they are much more difficult to control without injuring switchgrass seedlings. Research has evaluated the effectiveness of Certainty, Drive, Journey, and Pursuit on grasses as well as broadleaf weeds and the potential for injury to switchgrass seedlings. While these herbicides are registered for applications at various times, best results have been seen with pre-emergent applications. Post-emergent timings do provide weed suppression, but are not recommended to be applied until 3-4 leaves are present. This delay in application has resulted in reduced establishment and productivity compared to pre-emergent applications. Injury has been observed with Certainty, Journey, and Pursuit, but switchgrass seedlings outgrew this injury (see Table 2). Please note that Journey can only be applied pre-emergent and atrazine is not registered for use in switchgrass in Wisconsin. Once fields are established it is not expected that additional weed management will be necessary. Switchgrass is being promoted for several uses as a biofuel in Wisconsin. Uses include burning for electricity, production of cellulosic ethanol, and heating of homes and businesses. For biofuel production, fields are recommended to be harvested once per year in the late summer – winter. Harvesting two-three weeks after the first frost will allow the plant to recycle nutrients and likely reduce future fertilization as well as drying costs. Switchgrass is an excellent food source for livestock, and is especially palatable before plants flower, but its quality and palability decline rapidly as it approaches heading. Fields can begin being grazed when plants are 10 to 12 inches tall, and should be grazed down to 4 inches within two weeks. Then livestock should be removed and the pasture allowed to recover. Graze regrowth to no shorter than 8 inches. The final grazing should be on or before August 15th in southern Wisconsin and August 1st in the central and northern part of the state. If haying, cut at the boot stage leaving 3 to 4 inches of stubble. 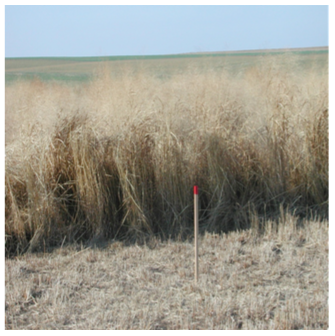 While switchgrass is a good forage for livestock, its persistence decreases with overgrazing, similar to other warm season pasture grasses, therefore fields must be managed carefully. Switchgrass provides excellent habitat for wildlife when used exclusively or in combination with other plant species. The vertical growth habit of switchgrass provides beneficial cover for many upland birds that allows for quality nesting sites and protection from predators. Switchgrass is also used extensively as grass filter strips for erosion control, flood management, and reduction of nutrient loading of waterways. Growing switchgrass can also help restore the original tallgrass prairie, one of our more endangered ecosystems. Restoring prairies can reduce runoff and reduce floods. For more information, contact UW Extension Weed Scientist Mark Renz, mrenz@wisc.edu. This factsheet was produced by UW Extension in cooperation with Southwest Badger Resource Conservation & Development Council, Inc., USDA-Natural Resource Conservation Service, and Better Environmental Solutions. Photos by Steve Bertjens and Brett Hulsey. Copyright 2009, UW Extension.